Explore Chile's lush Elqui Valley on a private shore excursion from your La Serena port of call. 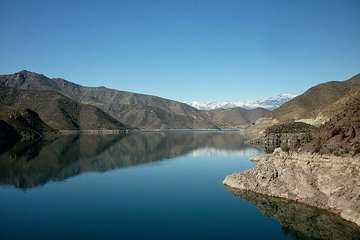 Set out for this stunning region where the bulk of Chilean pisco is produced, stopping first at Puclaro, an artificial reservoir offerings spectacular views of the area. Next tour a pisco factory, learn about the distillation process of this national spirit and enjoy a sampling or two before continuing on to Vicuña, the birthtown of poet Gabriela Mistral. Peruse the Gabriela Mistral museum, then enjoy lunch in Villaseca before returning to port. We had a fabulous tour. Our guides and driver were knowledgeable, and very welcoming. We saw a cross section of the local landscape and culture. The stop at the distillery was very informative and tasty. Our lunch cooked by the sun was superb. This tour was excellent. It was through Indoor America-Top Private Tours. The guide was very knowledgeable and could speak good English. Both the driver and guide were friendly and we had an enjoyable day with them. We went through La Serena city and seen the avenue of statues, lighthouse, main buildings and Le Recova market. Driving through the beautiful Elqui Valley country side stopped at Moya River on the way up to the Reservoir Puclaro. We visited the Pisco factory with stops for tastes and then on to have lunch which was all cooked by the sunlight in little cook boxes was very interesting. After lunch we made an extra stop at a local brewery tastes of the beers. This was above what the tour offered. We had an awesome day and I would highly recommend this to anyone in the La Serena area of Chile. Fantastic tour. Guide was wonderful and very helpful. Could recommend this to anyone. Overall a pleasant enough experience with the main drawback being our guides. Our English translator appeared to be less than interested in disclosing information shared with us during every stage of the tour. When asked what the Spanish guide was saying at various stages of the tour she would brush us off and translate an entire minute's worth of information in one or two sentences/words - literally cutting out the majority of the information being offered, or just saying that she didn't know how to describe it in English which defeated the purpose of her being there. We had a general sense of feeling pressured to buy things at each stop which was not ideal. The lunch in Vicuna was surprisingly nice and was the experience at both the pisco distillery and brewery. All in all, we're sure the tour would've been lovely in Spanish but the work around that was provided was unsatisfactory. This is an amazing tour. Scenery is beautiful and our guides Giovanna and Christian were excellent. Highly recommend it to anyone in the La Serena area of Chile. The guide, Eric , was outstanding and the driver, excellent. Were deceived that after getting off the ship and looking for Viator tour, we had to wait a while before discovering that the tour was provided by Planet tour. Interesting to find out how they cook meals with the Sun power. But the meal itself was no more than ordinary. We had a wonderful tour with Christopher, who spoke excellent English and was a wonderful, knowledgeable guide. We were taken up to the hills, through a beautiful town and to a Pisco factory. Lunch was at a solar powered restaurant and excellent. We were returned to our ship on time without any trouble.